Making things and make believe. For as long as I remember, I’ve loved making things and make believe. Playing ‘out of doors’ was favourite of all, making camps and mud pies, home made perfume (be under no illusion, my early recipes were disgusting!) daisy chains and bookmarks. I could go on… and on, playtime seemed endless then, and somehow still does, in that as a professional artist I am still invested in make believe and making things. Play time has just become a little more sophisticated! So too, my favourite place is still ‘out of doors’, nature, my abiding inspiration. Playing ‘indoors’, remains relatively unchanged too. Just as in childhood, my favourite indoor play things were my sewing basket, full of ‘making things’ (occasionally ousted for Moppet the family cat), drawing and painting things; they still are. Oh,I was very fond of Daz modelling clay and plasticine too. Now, I have countless sewing boxes, a plan chest full of paper, paints, fabrics, dyes, and so on… and on, and a bespoke ‘indoors’, my studio. Recently, I’ve found myself feeling reflective, ‘going back to my roots’, to use a somewhat cliched phrase. I’m often asked the seemingly straightforward questions: how long have you been an artist, and where did you study. Well, the straightforward answers are, I’ve been a professional artist for nearly thirty years now. 2019 will be the anniversary of when I left art college; in answer to the second question, Loughborough College of Art and Design. The less obvious answer would be, since childhood, in pursuit of making things and make believe, I was actually forging my future self. Before I digress into tales of ‘growing into myself’ creatively, there’s a point I’d like to make. That point being, the assertion that beyond innate creativity and imagination, I believe that the process of becoming an artist is largely dependant upon ‘life support’. The support and counsel of people we meet along the way; the relationships we forge. First, ‘life force’: family, then there’s playmates… baby sitters, carers, teachers. But before I launch into scripting an Oscar style speech; my intention here is to boast the positivity of a specific, special relationship, one with a whole supporting cast: ‘The Embroiderers Guild’. I was plugged into said ‘life support’ by the lovely, lively Betty Laker, she attended my very first exhibition, in the grand drawing room of Chettle House in 1989. Sparkling with enthusiasm for my work, she believed in me from the outset; that faith and friendship never wained. 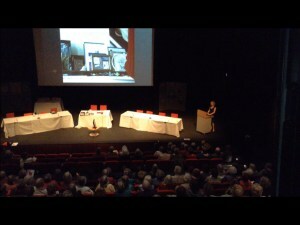 It was Betty that arranged for me to give my very first lecture, to Alton Embroiderers Guild. I was so nervous, I covered an hours lecture in 30 minutes and was asked, with great warmth and appreciation, to run through it once again! Since then, I’ve been honoured to be invited to countless Embroiderers Guild Branch meetings and AGMs, sharing my inspiration, working practice and creative process with thousands and thousands of engaging and enthusiastic Embroiderers. I wish that I could magically summon all the applause, gratefully received from those audiences over the years and play it back: to ‘The Guild and all its members’… but it would probably blow up the Internet! So instead, I laud you here, for all your support over the past (nearly) thirty years. My how time flies when you’re having fun! I urge anyone that isn’t ‘plugged into’ EG energy, to consider doing so, at any level: from learning to stitch, to joining a local branch, making friends… and beyond! Yes, this is ‘a plug’ for the Embroiderers Guild, borne entirely of personal conviction, no coercion whatsoever. I am truly honoured to have been ‘titled’ a ‘Big Name’ by the guild, and in turn, I hope for a prestigious future for the Guild, and all its members. Those who know my work will appreciate that I believe that God is in the detail, not the devil. I observe things meticulously, thereby drawing closer to the miracle of nature.